My hands open and lay flat. My feet have no nodules. My cherry hemangioma goes away. The skin on my body has tightened. My belly fat has gotten smaller. I feel happy and energetic. My eggs and bacon breakfast is already a carnivore meal. I contemplated this list for a while before I wrote it. My husband helped me come up with the “Wouldn’t it be Nice” idea for the title. These are the conditions that I’m hoping to attract by starting to eat Zero Carb. If you know me you know that I am aware of the Law of Attraction, and I know if I list all the issues I currently have in my body/mind, I might continue to have them. So, hence this positive list of what I want. Some people call this diet the Carnivore diet, the all meat diet, the zero carb diet. There are issues with whichever title we choose. The term “Carnivore Diet” sounds so “tearing of the flesh”. The “All Meat Diet” is ok, but I plan to eat eggs, cheese and butter. “Zero Carb Diet” is a step farther than low carb, but eggs have a small amount of carbs and cheese also has a small amount of carbs. So, maybe a list is better. 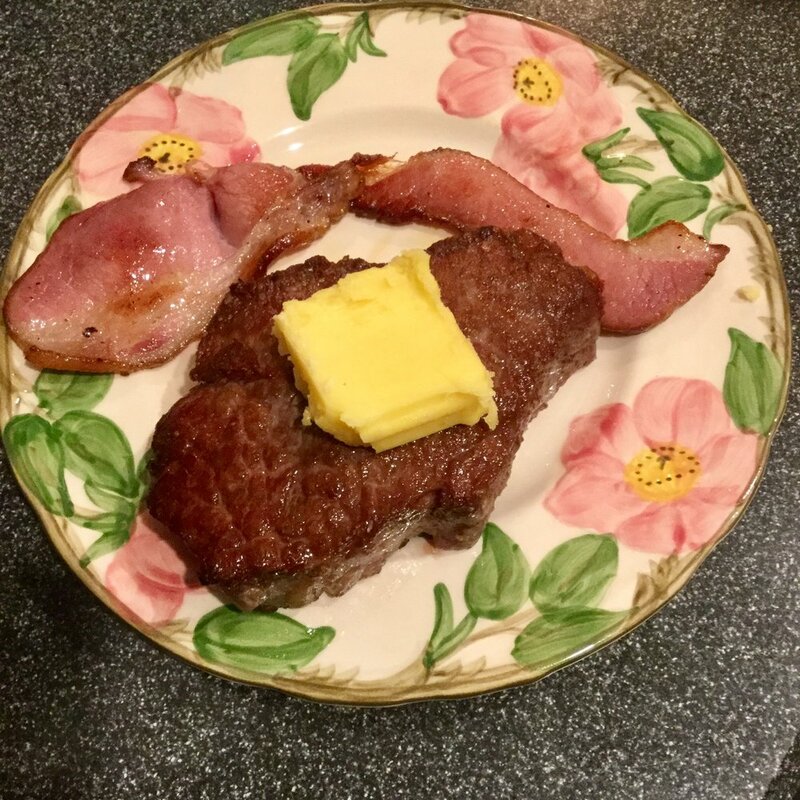 Steak, butter, bacon? I’ll take it! I guess we’ll see. My main goal is to be happy and further my health journey. I plan on writing blogs when I see progress. And I’ll certainly let you know how I’m doing on Instagram @thebuttereatter_t1d and FB Aimee Fields Perrin.